Two Pokémon can be stronger when they join forces, as you're bound to learn after checking out these collections featuring the new TAG TEAM cards! 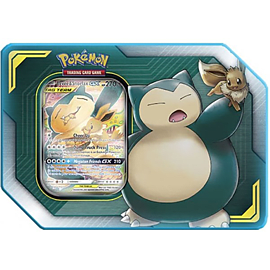 Choose from three powerful duos - Pikachu & Zekrom-GX, Eevee & Snorlax-GX, or Celebi & Venusaur-GX - in the Pokémon Trading Card Game: TAG TEAM Tins. Each of these fantastic tins contains an amazing pair of Pokémon who work together perfectly as a team - with a GX attack that can leave opponents in the dust!